BLO is an almost foolproof choice. 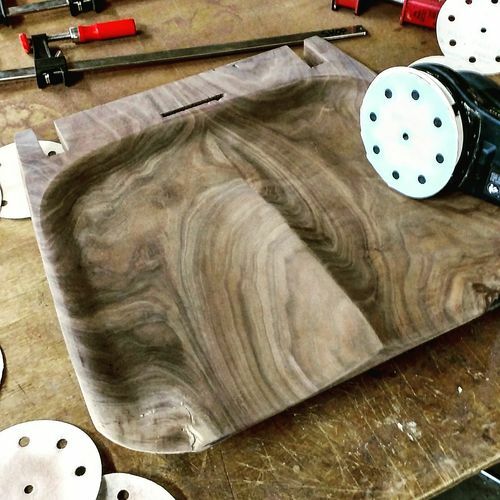 It goes great with walnut. I would not put this chair outdoors. If you do then you will be elevating the skill level in finishing as you will have to apply a weatherproof coating. My advise is do some research and be very careful there are “exterior” varnishes that are not very “exterior”. I would consider a marine epoxy if going outdoors. It partly depends on the look you want. Personally, I like walnut with an oil type finish (like the BLO recommended by rwe). Another option is Sam Maloof’s oil/poly finish which is easy to apply by wiping and a bit more durable. I think Rockler sells it. An oil finish is also true to how Nakashima’s furniture was (and still is) finished. Thank you for all your suggestions. I couldn’t upload pictures of my project earlier, but here they are. Please take a look and let me know what you feel about the project. Incidentally, I live about 15 minutes from the workshop. I did refer to this back when I was still in the process of building the chair. Thank you for reminding me of this valuable resource again! I just went though it again and it says that they just use oil and allow it to penetrate in the wood. I was concerned that since this is a chair which will mostly be a show piece but occasionally will also be sat on, would it be recommended that I put on a top coat of something durable? I am not very sure about the durability of Linseed oil, but I assume since its just oil and not really a coating, there maybe chances of the surface getting occasional scratches. Do you recommend applying a top coat of something that hardens but does not create a glossy/ effect? I may be wrong, but that’s what I felt when I was suggested to use the BLO. If it will see only occasional use, BLO or similar should be fine and its easy to apply. The BLO will polymerize when exposed to air, so it does offer some protection. If you want something slightly more durable, the Sam Maloof finish is based on what he used on the many rockers he made. The next step up in durability, while still retaining a similar look ‘close to the wood’ look would be something like General Finishes Arm-R-Seal. 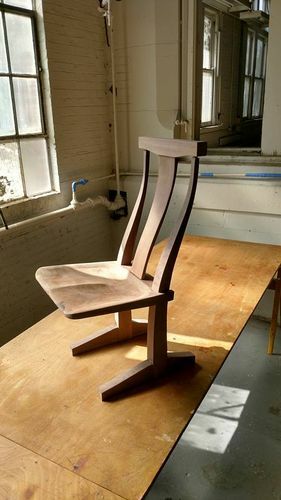 If this is your first time using any of these products, I highly recommend preparing some test pieces from your scraps- sand the the same finish as the chair then try out some finish options before you commit to the real piece!